Ooooh! Ahhhh! Pretty Stars! -- Me before the Start at the Lynchburg KOA Campground. I raced it as if I had fresh legs ... my legs were NOT FRESH! "I like those Oiselle arm warmers!" -- Michelle Andersen at Mile 15, acknowledging my impeccable running style. I hit the Reservoir Aid Station at Mile 22 in 3:04. Perfectly paced for a sub-8 hour, Top 10 finish. Then I turned uphill ... and the cramps began. "Got a bit of the Grindstone Hangover?" -- Jack Kurisky, 49, as he passed me at Mile 26. Aliza Lapierre passed me around Mile 28, power-hiking like a champ. I tried to save face by chatting about how we ran around each other for the first half of Western States. ... But I couldn't keep up, so the conversation ended rather quickly. I got up to The Loop Aid Station more than 30 minutes behind schedule. I lost 30 minutes in 11 miles! Brian Rusiecki and the other race leader exited The Loop (Miles 33 to 38) just as I was about to head in. Have you ever felt like your soul was being crushed? Obscenities were muttered. I wanted to throw my water bottle at somebody's face (mostly Brian Rusiecki's stupid, fast face). In The Loop, my muscle cramps settled down a bit, but I still couldn't pick up the pace. 14 men and 3 women passed me between Mile 22 and Mile 38. That's having to hear a half-hearted "Keep it up!" every damn mile for nearly 4 hours. I stopped to work out some muscle cramps for the final time around Mile 46. All told, I spent nearly 30 minutes of my race, across 6 hours of running, trying to work out some of the worst cramps I've ever experienced. I came upon Jack Kurisky with 3 miles to go. I offered to run into the finish with him, but that jerk didn't want to hold me back! "Dude! You got chick'd like four times!" -- John Andersen taunting me from his mountain bike with 2 miles to go. 8:58:10 ... a solid hour behind schedule. That hurt. A lot. My muscles haven't been this sore since I ran R2R2R only 6 months after picking up running. The months leading up to MMTR were a struggle. I spent 2 months in Physical Therapy working on hip problems, which were severely limiting my ability to train. Somehow, miraculously, I was able to pull out a strong performance at Grindstone. But I still wasn't out of the woods, so in the four weeks between Grindstone and MMTR, I only put in about 30 miles of running. In the final hours of Grindstone, I didn't push myself to the limit to protect my hip, and it seemed like my body was recovering quickly as a result. About 10 days out from Masochist, I did a tough workout and followed it up with a damn good 5K time trial the next day. It seemed as if my legs and hip were ready to go! But just to be safe, I took off the entire week before Masochist to make sure my hip was happy. Despite running over a dozen races in the previous year, I hadn't really pushed myself to the limit and given it my all since Grindstone 2015. 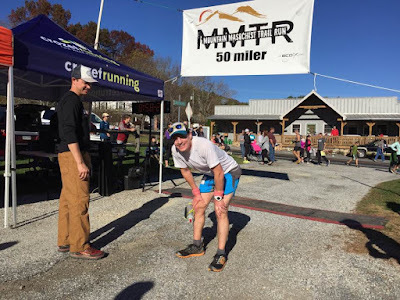 So I wanted to give it a go at Masochist and run as if it were an A race that I'd been carefully building up to, instead of a race 4 weeks out from a 100 Miler that I just needed to survive. I knew it was risky. Either my body would hold up and I'd have an incredible day, or I'd crash and burn half-way through and have a disaster of a day. I pieced together some splits for a 7:50-8:00 finish. That's been good enough in years past for Top 10. More importantly, that's what John Andersen was able to run the previous 2 years. If he can do it, so can I! Nevermind the fact that his times were on fresh legs. In the first miles of the race I was right on target. My body felt like it was working at 50 Mile Effort, but wasn't drifting into the realm of Marathon Effort or 50K Effort. I settled in just outside of the Top 10 and figured if all went well, I'd work my way up in the later half of the race. For awhile, I ran with or just behind Dan Spearin and Michael Dubova, who went on to finish in the Top 10 in 7:58. Early on, I noticed that I was dehydrated, so I made a point to refill my water bottle at every aid station and pound the liquids to get back on track. It wasn't affecting my running, but I started to fear that I was running on borrowed time. By Mile 22 at the Reservoir Aid Station, I was still perfectly on target, at 3:04, and my hydration had improved. Places 9-12 were just ahead, 30 seconds up on me. After a series of runnable smaller climbs, I was excited to tackle the 7 mile, 2500' climb in front of me. I like longer races with killer climbs cuz that means more walking power-hiking. I started my way up and everything quickly turned to crap. My quads and calves started to throw cramps. I stopped for a minute to stretch them out, but when I got back up to run again, it was clear they weren't going away. And just like that, my day was done. Looking back at my data, I ran the first 22 miles at a heart rate comparable to that of a marathon. While my breathing and my muscles felt like I was running at a 50 Mile Effort, it's painfully clear now that my cardiovascular system wasn't 100% ... cuz, you know, I ran a 100 Miler four weeks ago! So it makes perfect sense that my legs crapped out at this point of the race, 10-20 minutes after I would've finished a road marathon on fresh legs. Over the next 7 miles, I lost more than 3 minutes per mile from my goal pace. I had crashed and burned ... hard! Half way up the climb, at the Long Mountain Aid Station, I ran into Horton and joked I felt like I was at Mile 75, not 25. His response: Well DUH! Thanks Horton ... inspiring, as always! When I finally reached The Loop at Mile 33, Michelle Andersen was there to greet me. I did a lot of complaining, but she wasn't having any of it! She practically shoved potatoes down my throat and then tried pushing me on down the trail. All I wanted to do was stand around and wallow. In The Loop, things improved a little. I was still way off my goal pace, but I wasn't hemorrhaging time as quickly. The views were fantastic and the fall foliage was beautiful, and somewhere in that 5 mile stretch of trail I finally accepted the day for what it was -- a successful attempt at finding my body's limit, followed by a long training run in the woods. When the dust settled, my first experience with MMTR can be described as this: 22 exciting miles at Marathon Effort followed by 6 hours of cramp-infused jogging. My pace slowed from an 8:20 per mile pace to more than 12 minutes per mile after the cramps set in. Even if you set aside the amount of time I spent trying to stretch out my muscle cramps, I was still averaging nearly 11 minutes per mile. And to put that into some context, that's the same pace I ran all of Western States, and slower than my back-to-back 30 mile training runs before Grindstone which had comparable vertical gain. It was a slogfest to be sure ... but at least I got my snazzy puffy for finishing the Lynchburg Ultra Series (in 3rd Place I might add).